Brains or Brawn? Which Economic Development Policy is Best for Iowa? Cuba: An Emerging Market for Iowa Agriculture? 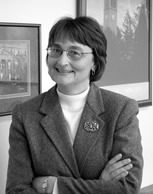 When Roxanne Clemens was hired as managing director of the Midwest Agribusiness Trade Research and Information Center (MATRIC) in July 2001, it was a return engagement to CARD. She first joined CARD in 1991 as a communications specialist in the Information Services unit. In 1993, she left to join the ISU Meat Export Research Center, where she edited the U.S. Meat Export Analysis and Trade News. "In that position, I had the opportunity to expand my knowledge about international meat trade and conduct market research in several countries," says Roxanne. After about seven years at the Meat Export Research Center, she went to work for NASA's Food Technology Commercial Space Center at ISU. "Working at NASA was fascinating," she says, "but I was pleased to be able to return to international trade issues." MATRIC's mission is to help small- and medium-sized Midwest agribusiness firms develop and expand export markets for agricultural products and technologies. Roxanne spends the majority of her time collaborating on research projects and preparing results. She also assists the director, Bruce Babcock, in soliciting proposals for new research and manages MATRIC's daily activities. "I think one of the most important assets of the MATRIC program is our ability to fund interdisciplinary research that is highly responsive to a rapidly changing international trade environment," she says. The influence of consumer preferences on the world's food supply is one example of how MATRIC research programs respond to the needs of agribusiness. "Consumers and their governments are increasingly concerned about food safety," she says, "and U.S. agribusiness firms need to adapt to regulations being implemented in other countries to ensure a safe food supply. These changes are occuring quickly and we need to know how they will affect U.S. competitiveness." MATRIC also focuses on helping U.S. agribusiness identify international niche markets, for those producers who want to move away from low-cost, high-volume commodity production. "With these niche markets, research is needed to measure any additional production, processing, and shipping costs, as well as potential price premiums," says Roxanne. "We also need to identify ways to protect niche markets from identical or similar products." At the same time, MATRIC works to identify emerging international markets with growth potential for traditional U.S. commodities. Roxanne's latest collaboration is on research involving meat trade with Mexico and the implications of full implementation of NAFTA. Other recent MATRIC projects have included a study of how Australia and New Zealand differentiate their beef in the global market, an estimate of U.S. costs of meeting non-hormone beef regulations in the European Union, and a case study of how the producers of Vidalia onions developed and protected their niche market. This and other MATRIC research is available online at www.card.iastate.edu. Roxanne says she feels gratified when, after the release of a research paper, she fields questions and gets feedback from producers and agribusiness. "That type of response is a good indicator that MATRIC research is being read and used by the people for whom we are conducting the research," she says. Roxanne grew up with five siblings on a farm near Little Cedar, Iowa. The family raised hogs, cattle, corn, and soybeans. "My favorite tasks were fieldwork and working in the farrowing house," she says. She now lives on a small acreage, minus the crops, livestock, and accompanying chores, and she and husband Marlin devote their leisure time to remodeling their home, refurbishing the outbuildings, and landscaping. She also enjoys canoeing and camping, traveling, reading, and spending time with family and friends. ?